To find the Fitover that fits your frames, start by measuring your frames with a ruler. Enter the measurements and Click the FIND MATCHES button. After you click the button, we’ll show you the Fitovers that will work best with your frames. All results will fit over your glasses comfortably. 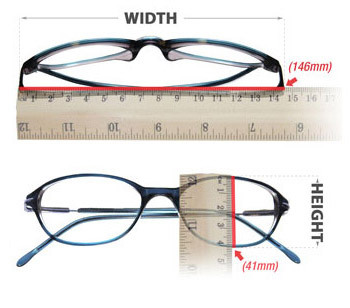 For the best fit, choose a frame that is slightly larger in width and height than your frame measurements. Results are displayed from closest fit on the top to widest fit on the bottom and displayed within a 10mm variance to ensure a fashionable fit and look.